Vinny Desautels, a 7-year-old Californian boy, who donated his hair to children with cancer last month, is now fighting the same battle. The second-grader had grown out his hair so he could give it to Wigs For Kids, a program that helps children with cancer who have lost their hair. 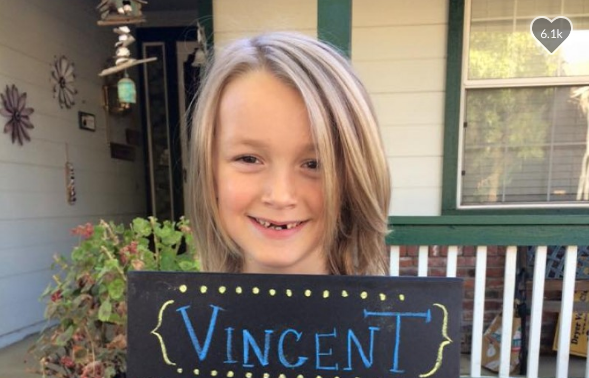 “Even though he was teased throughout the 2 years of growing his hair out, it didn’t deter him from his mission … to help a child in need,” said Vinny’s grandparents on a GoFundMe page for the boy. It all began when Vinny came home from school one day complaining about knee pain. His parents then noticed a lump on his right hip and took him to the emergency room. X-rays found a tumor in a pelvic bone, according to the Washington Post. Vinny then went to an eye doctor, since he had a swollen eye which had been getting gradually worse over the course of a month. The parents at first thought it was allergies, but it turned out to be another tumor. Since the diagnosis, Vinny has been undergoing numerous tests. His family told the Washington Post the boy would begin chemotherapy treatment on May 10. “They’re at Sutter Medical Downtown Sacramento. They’re still conducting tests on Vinny,” said his grandparents. The GoFundMe campaign for Vinny was started to help the family with medical expenses. Vinny’s mom, Amanda Azevedo, a hair stylist, is 6 months pregnant with the family’s third son, and had to stop working to care for Vinny. His father, Jason Desautels, has also taken time off his job at a farm hardware company. He is a U.S. Army veteran who served in the infantry for 7 years, including in Iraq, according to the Post. Desautels served in the Second Battle of Fallujah, the bloodiest fight of the war in Iraq, but now his family is fighting another battle back home. “None of that really prepares you for this,” he said. Nonetheless, the family still has hope. “As long as we’re there with a smile, telling him he’s going to be alright, he has the same attitude,” Desautels said. The “Victory for Vinny” GoFundMe campaign has raised $295,849 as of 4 p.m. May 10.